My Roast Chicken & Creamy Garlic Mushroom Burger is a complete meal in burger form. 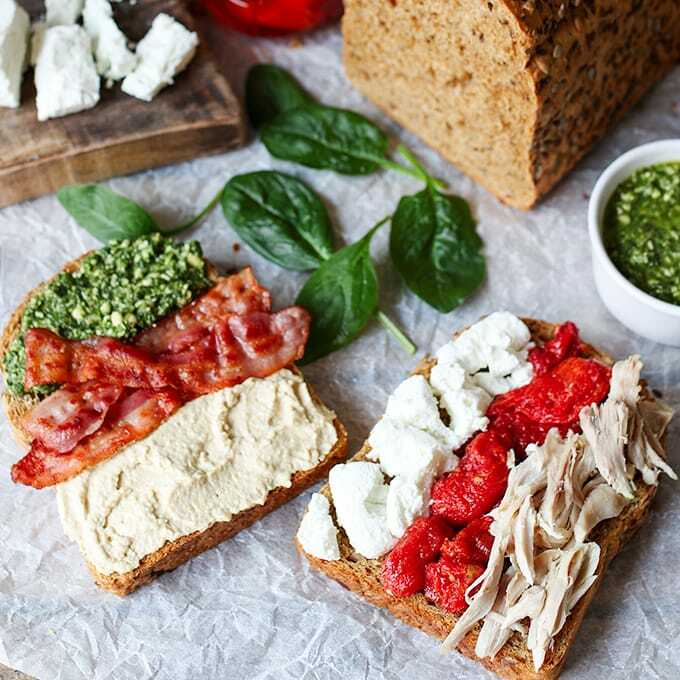 This Roast Chicken Sandwich is so delicious – but make sure you have napkins on hand!! Let me just sit back and look at this photo again. I want to re-live this roast chicken sandwich. Oh it was so good! 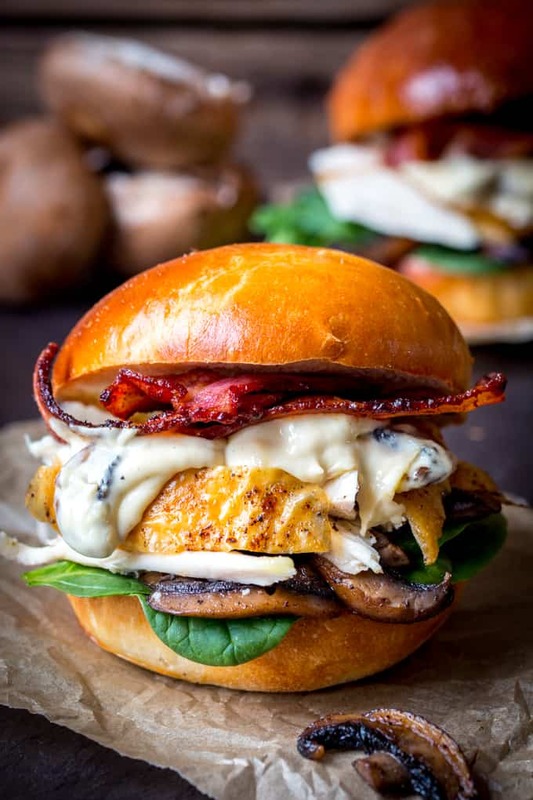 Slices of roast chicken piled on a homemade brioche roll with fried mushrooms, creamy-cheesy garlic mushroom sauce, crispy bacon and leaves of baby spinach. I may have also made this one step naughtier, by lightly toasting the inside of the brioche, and then finishing it off in the pan with the leftover bacon fat. Sometimes you’ve just got to finish off your toast in bacon fat. I’m reasonably sure that the happy endorphins released when you bite into bacon-fat-toast cancel out the cholesterol. Don’t they? My theory falls within the same gastronomic phenomenon area as the one that says ‘having an extra shot of espresso in your latte raises your metabolism enough to cancel out the calories in the milk’ and ‘you can eat a whole box of chocolates in bed, for breakfast, on your birthday – and you won’t feel sick and fat when you finally get up’. Yes, I’m 36 today. I glumly mentioned to Chris that I’m now closer to 40 than 30, and he helpfully pointed out that I’ve been closer to 40 since the day after my 35th birthday. Whilst I love him dearly, I do so want to punch him sometimes. He quickly made up for it by TOTALLY SPOILING ME today. Amongst my pile of presents was a new bike!! Now that Lewis – my youngest – is riding well on his two-wheeler, it was time for me to get riding again (I haven’t owned a bike for about 5 years) – so I can’t wait to go out for some family bike rides. Chris also bought me a beautiful set of Damascus steel chef’s knives!! I spotted them on a knife skills course I went on last month, and have been pining for them since, but they were just too expensive. So now I have 5 ridiculously sharp knives for every cutting job in the kitchen (and the A&E department on standby). Ok, I need to stop talking before I actually do mindlessly eat this whole box of chocolates. 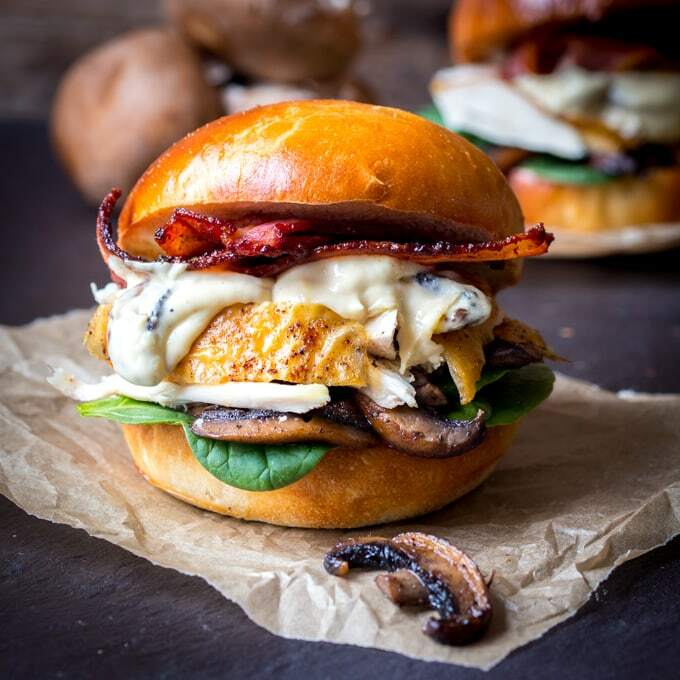 This Roast Chicken & Creamy Garlic Mushroom Burger has Roast Chicken on Homemade brioche with creamy garlic mushroom sauce, crispy bacon and spinach. The best sandwich. Ever. Place two frying pans on a medium-to-high heat. Place 1.5tbsp oil in one, and 1/2 a tsp oil in the other. Once the oil is hot, place the sliced mushrooms, salt and pepper in the pan with more oil in, and the streaky bacon in the pan with less oil in. Cook both the mushrooms and the bacon until dark and a little crispy. Place the bacon and half of the mushrooms on a warm plate. 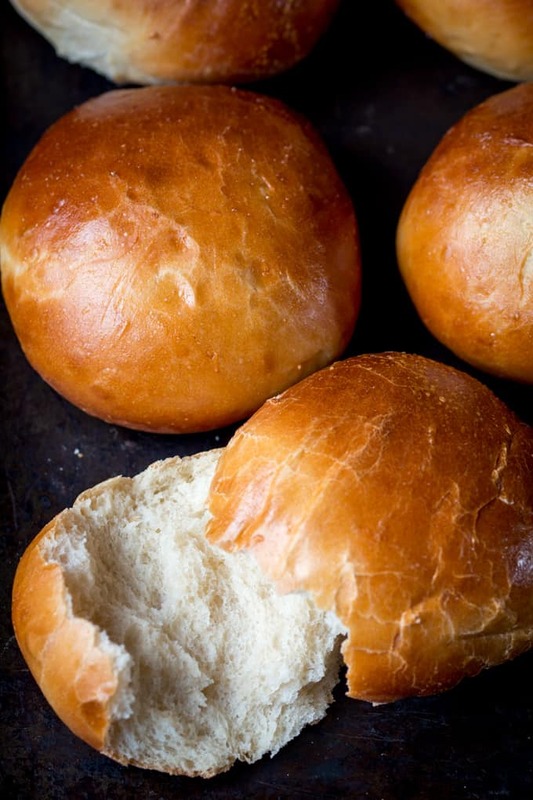 Cut your brioche rolls in half and lightly toast the insides under the grill. When toasted, place the rolls cut-side-down in the bacon pan, and allow the rolls to cook a little more in the leftover bacon fat. Take out once the rolls are darker brown and the fat has been absorbed. Place the rolls on plates. Add the garlic to the remaining mushrooms and cook on a low heat for a minute, then add in the cream and cheese and bring it to a gentle bubble. Let it bubble lightly whilst you start putting the burgers together. Divide the spinach between the 4 burger rolls, then top with the fried mushrooms and sliced chicken. 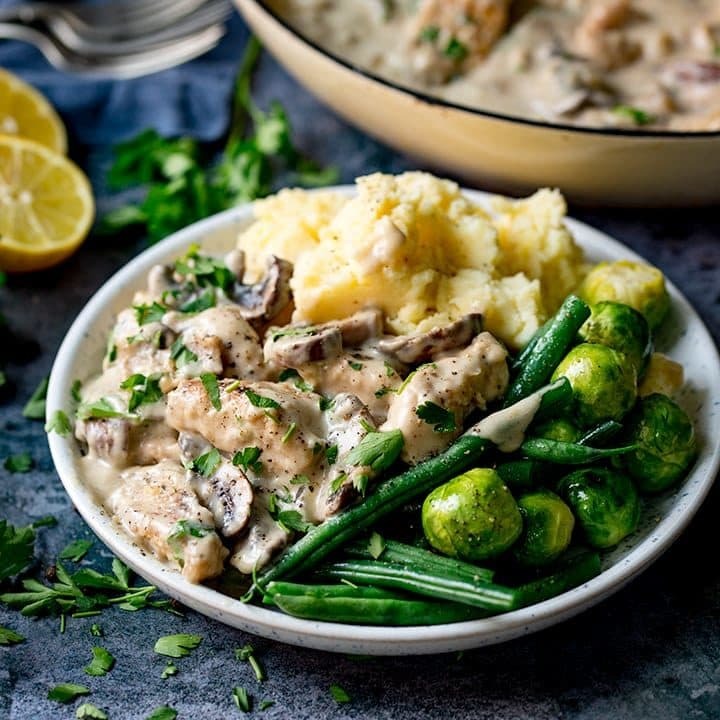 Spoon the cheesy mushroom sauce over the chicken and then top with the crispy bacon. Place the top of the burger roll on top and serve. Love this unusual burger. 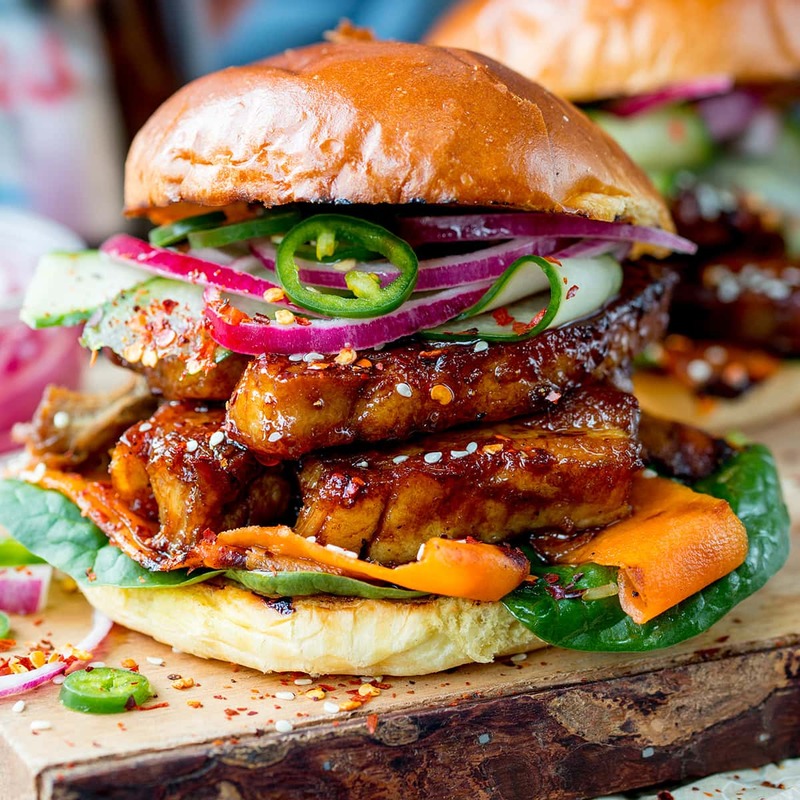 Next time I make this I am going to make my own brioche buns too. OMG! This looks and sounds so delicious! I’m adding it to my menu ASAP! Yes, we sure did! Made it tonight for dinner. Even hubby, who doesn’t always like chicken, loved it! So freaking delicious! 🙂 Thanks for the compliment Peter!! Thank you so much for sharing. I can tell you love good food as much as I do. oh my gawd, this looks amazing!!!!!! Happy Birthday! 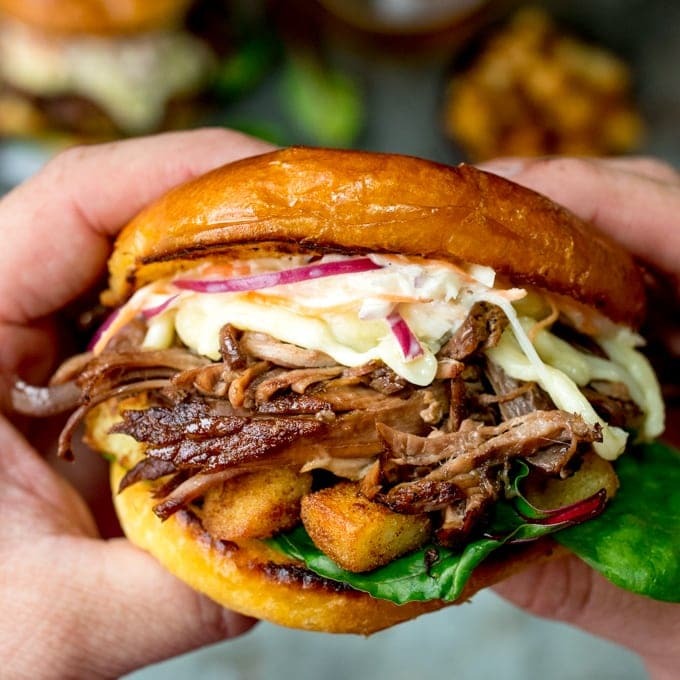 This sandwich is mouthwatering and the homemade brioche buns are beautiful! 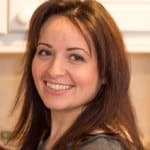 I’ve just been drooling over your chocolate crepe cake recipe yummmm! Happy Birthday! I turned 36 this year too, it’s the worst! So not amused. I totally agree with you on the bacon fat, I won’t make pancakes without it. Love the sandwich, drool! Incredible burgers.. and I know they would have tasted delicious – brioche makes everything 10 x better! Doesn’t it just. I wish the UK weren’t so far behind in selling brioche though!! HAPPY Birthday to you…..(I’m singing to you). Wow! This sandwich looks so amazing. Your photo is to die for and I am pinning it to impress my hubby one day.